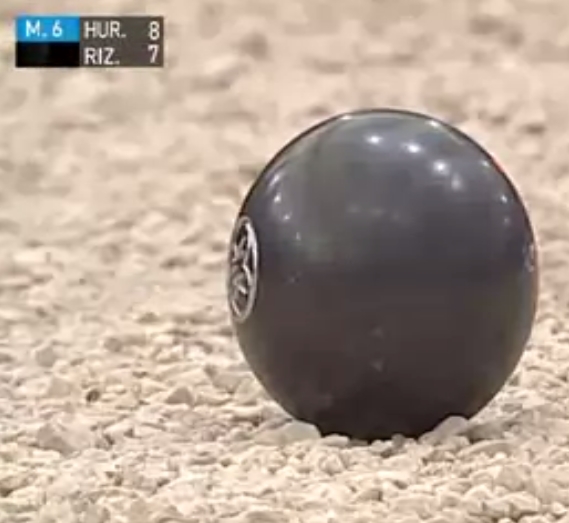 If you like to watch petanque videos on YouTube, eventually you will run across a video (like 2éme Demi-Finale PPF 2015 part 3) where things just don’t look right. The players may look too tall and thin. Or too short and squat. You may see the image on the left, when you know you should be seeing the image on the right. The problem here is that the person who uploaded the video to YouTube made a mistake and uploaded the video with the wrong aspect ratio. The easiest solution is to go to www.videolan.org/vlc and download and install a program called VLC. VLC is a free, open-source, cross-platform multimedia video player. It is safe and reliable. Download and install it. Once you’ve installed it, you can use VLC, rather than your browser, to play YouTube videos. Here’s how to do it. When you’re using your browser to watch YouTube videos, and you find one with a bad aspect ratio, select (highlight) the URL (web address) of the video and copy it (press CONTROL+C, or right-click and select COPY). Then open VLC. On VLC’s Media menu, select Open Network Stream. 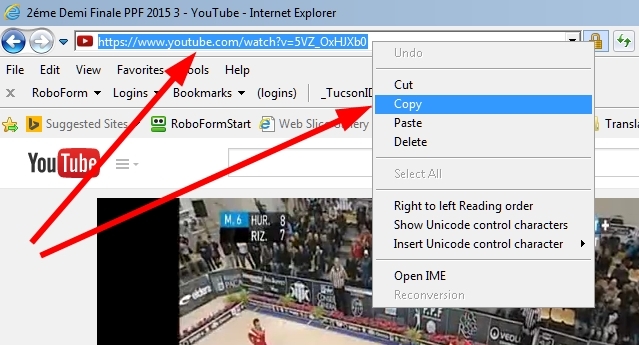 Then paste (press CONTROL+V, or right-click and PASTE) the URL there, and click on PLAY. After it starts, an easy way to change the aspect ratio is simply to repeatedly press the “A” key on your keyboard until the video displays with the correct aspect ratio. 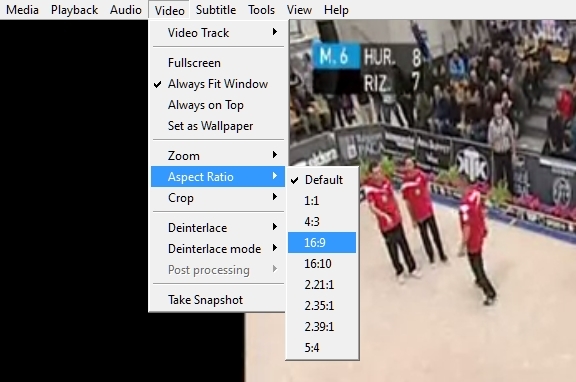 If you prefer to do things a bit more explicitly, you can use your mouse to select Video, then Aspect Ratio, then the aspect ratio that you want. If you really want to study a video, VLC has a couple of other useful features. One is a “loop” feature. 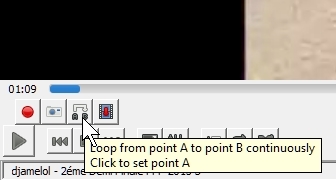 If you click on the LOOP icon, that marks the beginning of a video clip. 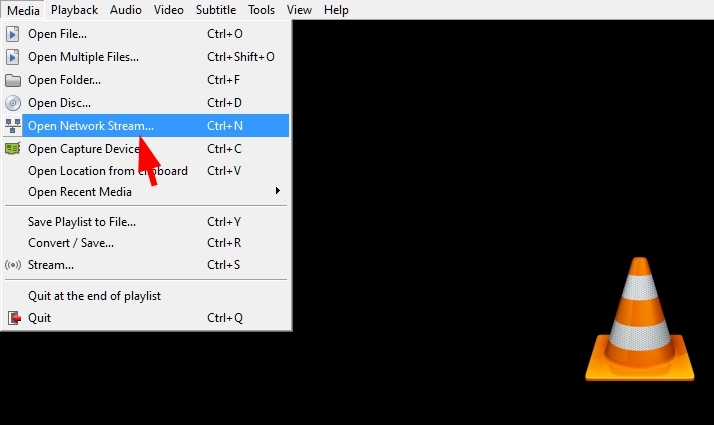 Click a second time on the LOOP icon, and VLC starts playing that same video clip over and over, so you can watch it over and over again as long as you want. Click on the LOOP icon again, and looping stops and normal play resumes. If you click on the FRAME-BY-FRAME icon, the video freezes. Then each time you click again on the FRAME-BY-FRAME icon the video advances one frame. This is the ultimate possible slow-motion playback. Clicking the wedge-shaped PLAY icon will cause VLC to resume normal display of the video. 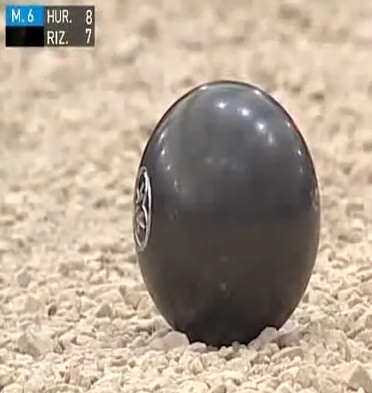 This entry was posted in Pétanque, Training & practice by Jules Lenoir. Bookmark the permalink.